Junior Results :: The Union exists to promote golf in the County and to provide competition for the top county players as a route to Midland and International golf. Darnford Moors - Tom Gould, Sam Easterbrook, Charlie Pegg, Josh Zannin, Brook Gillard. Branston - James Wikkinson, James Bailey, Alexei Glass, Harry Shepherd, Isaac Lamb. South Staffordshire - Will Dunn, Max Strudwicke, Ben Halldearn, Ethan Hawkins & Luke Ryan. They enjoyed a very hard fought final at Perton Park GC. Winners were Darnford Moors, who just pipped Branston, with South Staffordshire in 3rd place. 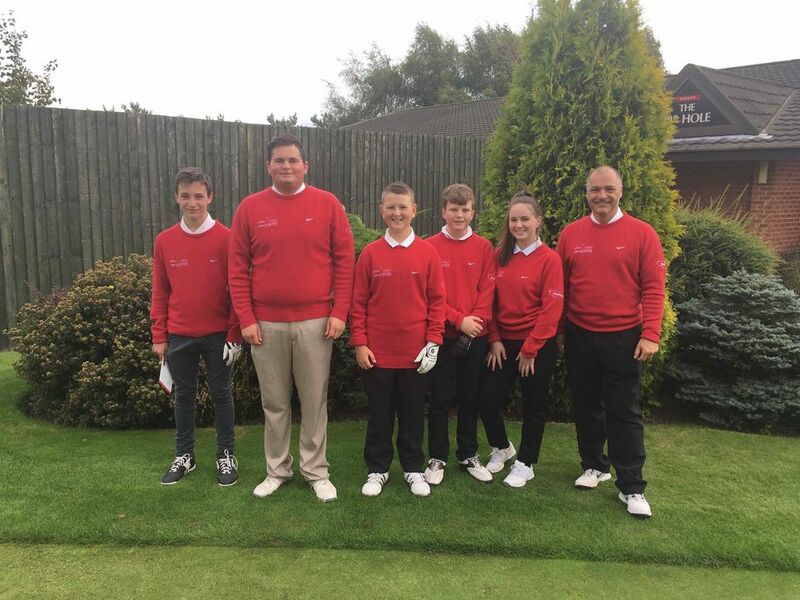 They will represent Staffordshire at the England Golf Club Teams event in 2017. Details of results are under Juniors, Leagues. A very enjoyable matchplay contest was won by Gloucestershire after a countback on Games won with Worcestershire, with the result hanging on the last match, 18th green after 2 days golf. Warwickshire were in 3rd place and Staffordshire in 4th. having lost all 3 matches by a narrow margin. Full results will follow in the Juniors section. It is worth noting that in 2004 this same contest was also hosted by Broadway GC, with Chris Woods playing for Gloucestershire & Andy Sullivan playing for Warwickshire, both of whom are playing in next weeks Masters at Augusta! Boys team and county officials pictured above. The 2015 Championships were held at Sandwell Park GC on 28th May. The course was in excellent condition, but the weather was windy. The first round leader was James Wilkinson (Branston GC) with an excellent 66 giving James a 10 stroke lead. Although James didn't play as well in his 2nd round his Gross total of 148 was good enough to win from Staffs U18 Boys Captain Matthew Downes (Ingestre Park GC) who scored 152. Max Strudwicke (South Staffs GC) was the Nett Champion. Good performance and victory by the Boys in what was their first league game of the season. The game was played against a competitive side from Shropshire & Herefordshire in good weather conditions at a very well presented Worfield Golf Club. The match, as it is the norm against Shropshire & Herefordshire, was played in very good spirit by both set of players and the hospitality from the host County was second to none. The 2014 Midlands Boys County Championship held at Kedleston Park Golf Club on Sunday 19th October 2014 was won by Alex Chapman, Trentham GC, with a great performance posting the lowest score of the tournament (only player under par) to win the individual gross by 2 shots. Alex's score of 71 (-1) was the more remarkable considering the harsh weather conditions on the day and the challenging Kedleston Park Golf course. 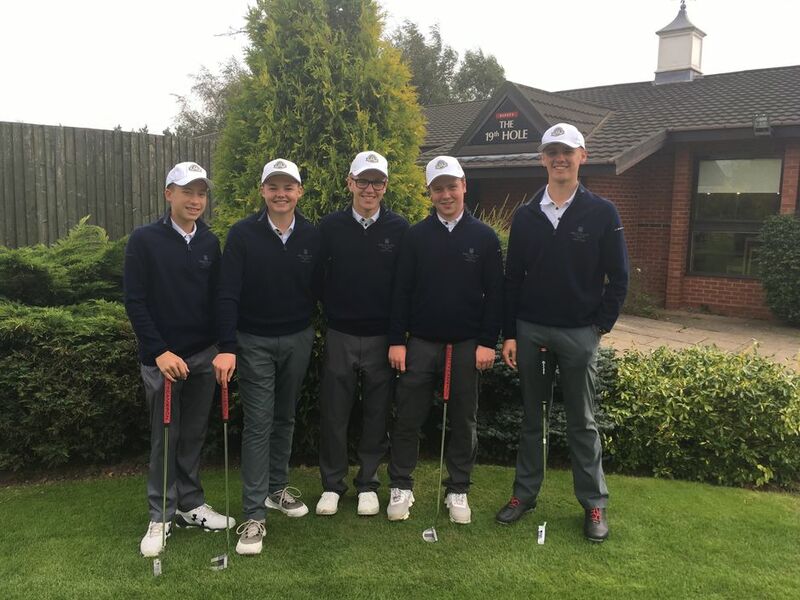 As a team the Staffordshire Boys ended the tournament tied for 3rd place with a total score +38, six shots from second place Nottinghamshire and nine shots from the eventual winners and hosts Derbyshire. Stafforshire individual scores: Alex Chapman 71 (-1), James Wilkes 78 (+6), Jack Smith 81 (+9), Ryan Chadwick 83 (+11), James Wilkinson 85 (+13). 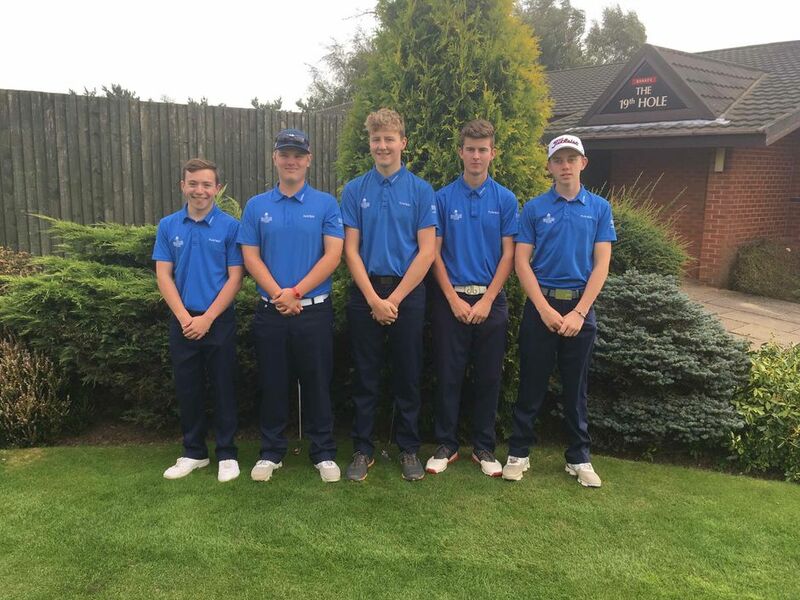 2014 U18 Staffs Boys Matchplay Championships played at Stone GC recently resulted in a win for Matthew Downes (Ingestre Park GC). Matt beat Matthew Jacques (South Staffs GC) 3&2 in the semi-final. Jake Mcgoldrick (Enville GC) beat Alex Chapman (Trentham GC) 1up in the other semi-final. Matt then beat Jake 8&7 in the final. A happy Matt is pictured receiving The John Slaughter Trophy from SUGC President Roger Waite. Also in attendance are Staffs Junior Chairman Mike Tunnicliffe and proud dad Steve Downes. 2014 Staffs Boys Open Championships were held at Penn GC on 1st Aug. This is normally a 36 hole championship. However, due to poor weather conditions the afternoon round was cancelled and the results of the morning rounds stood. 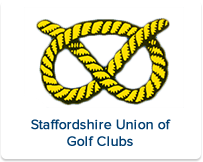 Staffs U12 & U14 Championships were held at Brocton Hall GC on 22nd July. 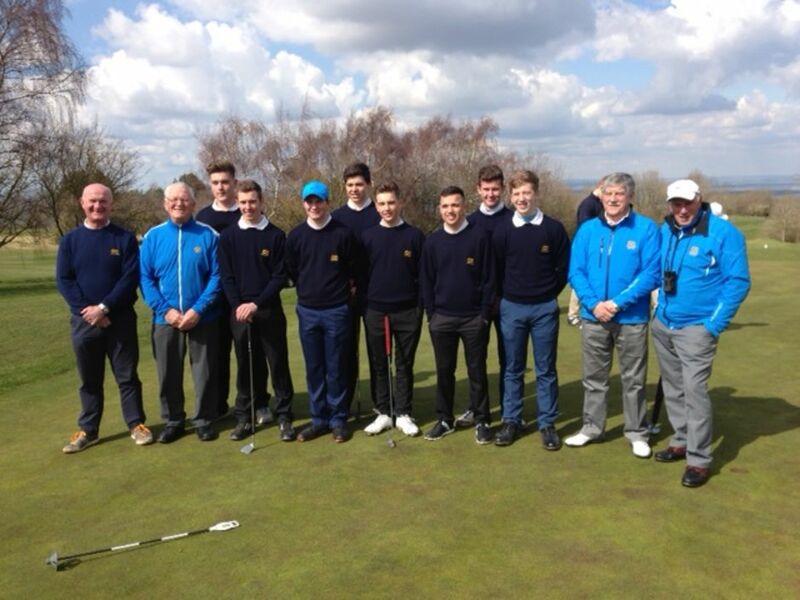 Brilliant sunny weather and a course in excellent condition welcomed 30 juniors playing for County Titles. President Roger Waite and the some of the Staffs Junior selectors were among the large number of spectators watching some very entertaining golf and considering the ages of the players returning excellent scores. Looks like some new talent has emerged.